Originally posted: January 27, 2019 . Last modified: January 29, 2019 . 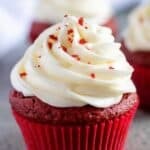 Our red velvet cupcake recipe features a cake mix cupcake with homemade frosting. This Valentine’s Day, make a sweet treat for that special someone. Cupcakes are an all-time favorite in our household. A perfectly sized piece of cake, complete with frosting, all within the palm of your hand. What could be better than that? 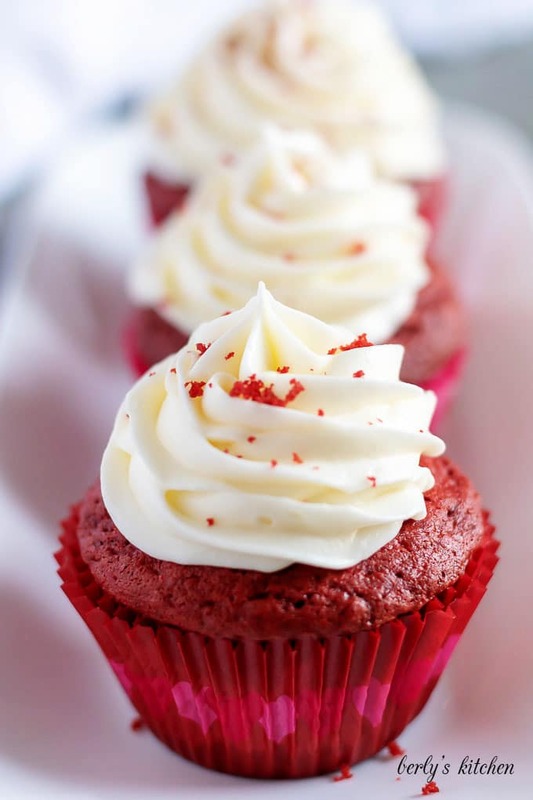 For today, we decided to share our red velvet cupcake recipe. I feel it’s a wonderful dessert for Valentine’s Day. The cupcake is red and white, the most romantic colors I can of for that celebration. Plus, it’s small size makes a wonderful way to finish up a candlelit dinner. Honestly, who wants get overstuffed with a heavy dessert, then try to get, “more comfortable,” with a significant other? Since Kim and I tend to make things easy for ourselves, we decided to use a cake mix instead of a full-blown homemade recipe. However, she dressed it up a little by adding sour cream and vanilla extract. These two ingredients serve to add another layer of flavor to each bite. As you will see from the photos, each cupcake is topped with cream cheese frosting. The frosting is homemade, but can be prepared in less than ten (10) minutes. Of course, that only happens if you’ve pulled the butter and cream cheese out to soften. If not, no worries, I’ll provide you will some tips below that will help. Shall we get started? It’s time to get cooking and you know what that means, prep those ingredients. 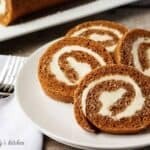 Pull out the butter and cream cheese to let it soften long before you start the frosting. Also, go ahead and grab the eggs, measure out the oil, etc. Trust me, it makes the whole process a lot easier when you have everything prepped in advance. Why do think restaurants have prep cooks? Once you have everything ready to go, break out your hand mixer or stand mixer. Additionally, preheat your oven to 350 degrees F. and line two (2) cupcake pans with decorative liners. We went with red for obvious reasons. After that, in a bowl combine the cake mix, eggs, sour cream, oil, vanilla extract, and water. Mix all these ingredients together to form the batter. Then, use a measuring cup, preferably 1/4 cup, and carefully transfer the batter to the liners. In the end, the cupcake liners should only be about 1/2 full with batter. Otherwise, you risk the red velvet cupcakes overflowing while they cook. Place the pans into your oven to bake for about twenty (20) minutes or until they are done. Use the toothpick method to be sure. When they are done, remove them from the oven and set them on a cooling rack to rest for about half an hour. Alright, now to the easy part, the frosting. 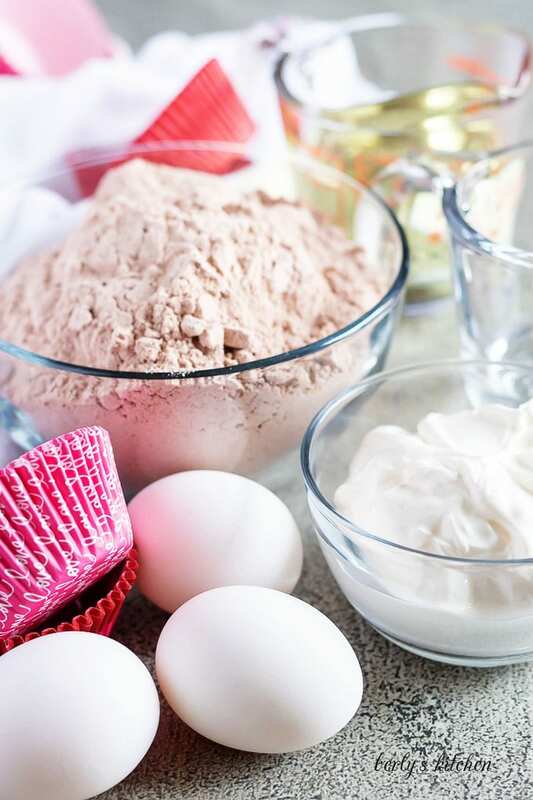 Clean out your mixing bowl, or grab a new one, and combine the butter, cream cheese, milk, sugar, and vanilla extract. Blend everything together to create a smooth, creamy frosting. If it’s too thick, add more milk (one (1) teaspoon at a time) until it reaches a consistency you like. With the frosting done, check on your cupcakes, if they’ve cooled enough, then apply the frosting using a bag or cupcake decorator. That’s it, you are done! Serve them and enjoy each bite. Oops, you forgot to pull the butter and cream cheese early. You have a couple of options to help soften each one. You can try the microwave method. That entails heating the butter (or cream cheese) on low heat for 15-20 second intervals until they soften. I don’t do this because I’ve had too many instances where the dairy exploded in the microwave. We either use a window on a warm day or on chilly days, a space heater on low. Simply place the cream cheese on a window sill or in front of the heater until it is soft. For a moist red velvet cupcake, we have found that cake mixes that include pudding in the box, work the best. Okay, when you make the frosting, it should be just enough to cover all of the cupcakes. With that being said, I always recommend making a double batch of frosting when it comes to cupcake decorating. Mainly, because everyone uses different amounts of frosting per cake. So, it’s better to have some left over than not enough. If you want to add an extra garnish, then try using red sprinkles or dyed sugar. Alternatively, you can do what we did. Tear one cupcake apart and use the crumbs to sprinkle on top of each dessert. Not everyone has piping bags or cupcake decorators. In the past, I used to take a seal-able freezer (sandwich) bag and fill it with frosting. Then I would close it, twist the bag to build pressure, then gently cut away the bottom corner (left or right side only) to a create hole. Thus, turning a plastic bag into a piping bag. It wasn’t perfect, but it worked. Looking for more dessert options? Then take a look at these household favorites! 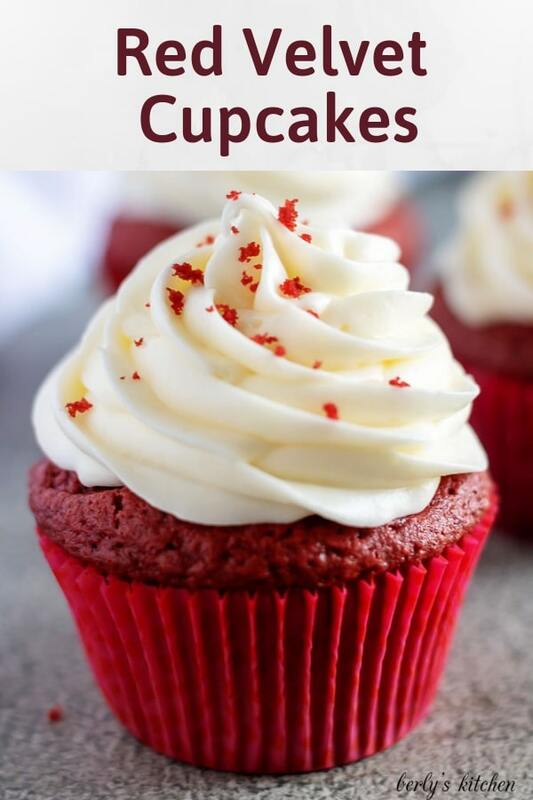 If you like our Red Velvet Cupcake recipe, please leave us a comment and rate the recipe card. You can also find us on Facebook, Pinterest, Twitter and Instagram searching for Berly’s Kitchen! 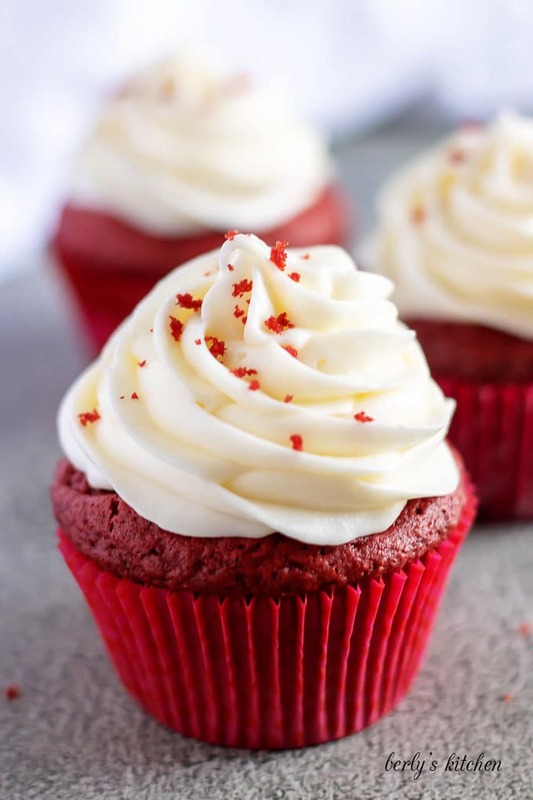 Our red velvet cupcake recipe features a cake mix cupcake with homemade frosting. This Valentine's Day, make a sweet treat for that special someone. Preheat the oven to 350° F. and line two muffin pans with cupcake liners. 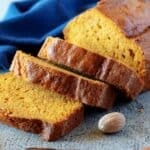 In a large bowl or stand mixer, combine the cake mix, eggs, sour cream, vegetable oil, water, and vanilla until combined. Do not over mix! 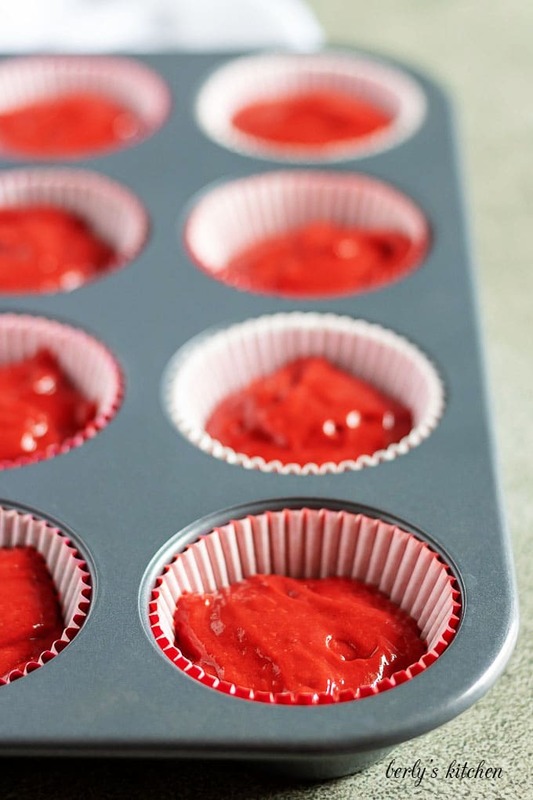 Use a ¼ cup measuring cup to fill the cupcake liners. Each liner should be about half full. Bake the cupcakes for 18-22 minutes or until a toothpick inserted in the center comes out clean. Remove from the oven and allow to cool completely on a baking rack before frosting. About thirty (30) minutes. In a large bowl, combine the cream cheese, butter, powdered sugar, milk, and vanilla. Mix with a hand or stand mixer until smooth. Add additional milk by the teaspoon if needed to reach the desired texture and thickness. Use a piping bag or decorating tool to apply the frosting to the cupcakes. Serve and store any leftovers in a sealed container in the refrigerator for up to three (3) days. The calories listed are an approximation based on the ingredients and a serving size of one (1) red velvet cupcake. Actual calories will vary based on the size of the cupcakes. 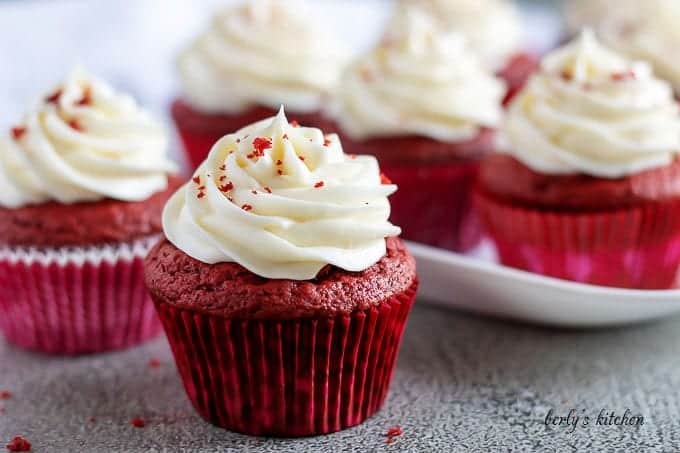 The servings listed as twenty-two (22) are also based on the amount of batter used in each cupcake (which also affect the size of each cupcake). The dessert can be stored in your fridge, in a sealed container, for up to three (3) days.